In my last post, I spoke of the touristy foods – chocolate, waffles, fries, and beer – that I experienced on my trip through Belgium to Amsterdam. These things were exponentially better than I expected – the fries were crisped to perfection, the waffles a sugary dream, the chocolate the darkest and smoothest I have ever seen, and there were more beers than I could ever have imagined. But I soon discovered that these foods are a small part of the whole story. The food scene in Belgium and the Netherlands is exploding! Bio-ingredients are becoming more accessible, restaurants are cooking all organic dishes (with many vegan/vegetarian options), and there is a renewed interest in agriculture. What’s more, I found a beneficial influence of foreign cuisines (including American!) while traditional foods were still easy to find. The traditional Dutch and Belgian foods that I tried were quite heavy, sweet, and filling. In Brussels I tried a Mattenaart (a type of breakfast cake) at De Skieven Architek, a Belgian café. The outside crust resembled flakey croissant dough, while the inside was a dense soft vanilla cake flavored with almonds. At Bakery Goosens, the oldest bakery in Antwerp, I tried traditional raisin bread, with a small crumb that paired perfectly with the tart, moist raisins. 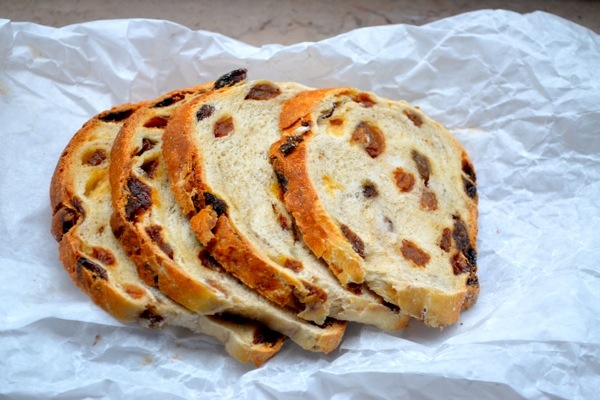 This would be the perfect bread to make cinnamon toast with! Finally, in Amsterdam, we celebrated the New Year with Olibollen – fried raisin dough balls – and appelflappen – fried apple pastries coated in cinnamon sugar. A sweet start to 2012! But other cuisines were starting to emerge. In Antwerp’s Chinatown we slurped down scalding noodle soup and fried spring rolls. In Amsterdam, Turkish, African, and Asian restaurants could be spotted on every street corner. But more than anything, I was excited to see the return of my favorite “American” foods – cream cheese, bagels, wraps, even peanut butter! McDonald’s and Starbucks appeared rarely, while specialty take-away restaurants prevailed, like Soup en Zo (a takeaway soup counter in Amsterdam), Bocca (a pasta joint in Antwerp), and Au Suisse (a deli in Brussels). The bio-movement was incredibly prevalent, with fresh food markets in every city we visited. More often then not, our lunches consisted of fresh soups or salads, made with all bio-ingredients. 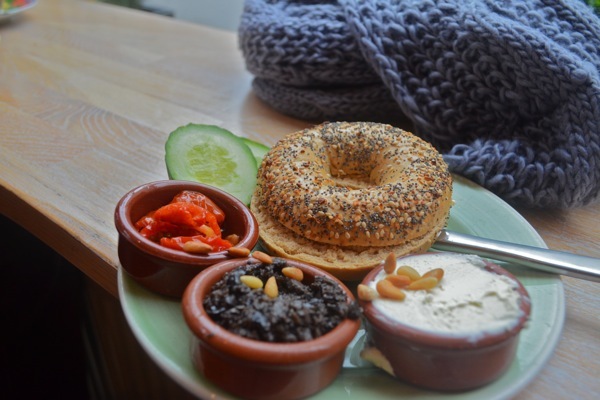 There were even organic chain restaurants, like Bagel and Bean in Amsterdam, where a variety of hot bagels, with toppings like warm goat cheese and almonds or olive tapenade and sun-dried tomatoes, made from all organic ingredients, were served. So good I ate there twice in five days! But my favorite part of the whole trip? The coffee houses, where I could finally get perfectly brewed espresso and large drip coffee with freshly roasted and ground beans. 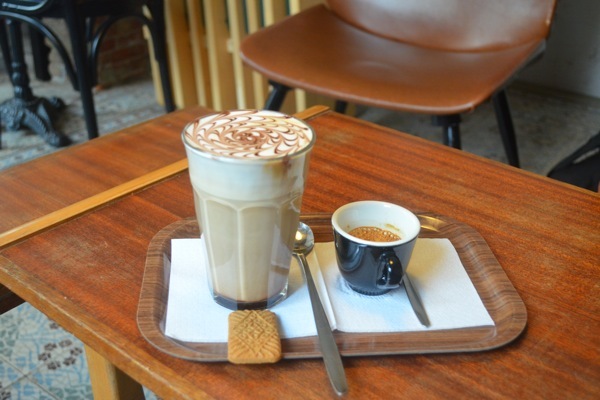 With each coffee came a “sweet” – usually a gingerbread cookie or a chocolate. I took full advantage of these cafes; spending most afternoons reading, sipping my coffee and snacking on my gingerbread cookie. Alexis ZK studies French and Food Studies at New York University. She loves travel, dinner parties, digging in the dirt, ballroom dancing, foodie adventures and creating tasting menus in the shower. She recently ran away to Paris on a mission to discover France through food.